Dr. Victoria » Build your very own mud house! Build your very own mud house! 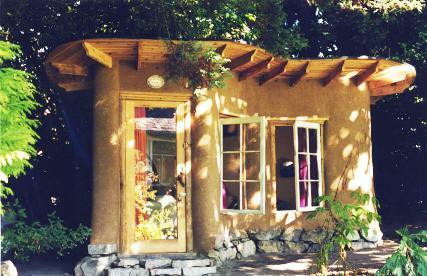 Cob building is nothing new, in fact is one of the oldest building methods in the world. Cob is basically clay mixed with sand and straw. Straw gives it great tensile strength as well as remarkable insulative qualities. Building with earth itself is very smart, as it is plentiful and cheap. It is basically dirt. In greater parts of Africa it is still the building method of choice, till this day. It is also experiencing a revival in Europe and Northern America. It is a reflection of the times, where people are becoming debt slaves to banks in order to pay their mortgages. One can end up repaying the bank for a whole lifetime, just to have roof over one’s heads. 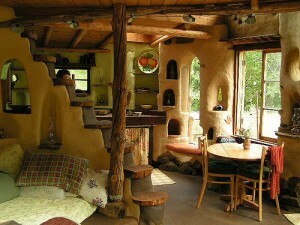 Well, some people decided that enough was enough and went ahead building their very own houses made of cob. 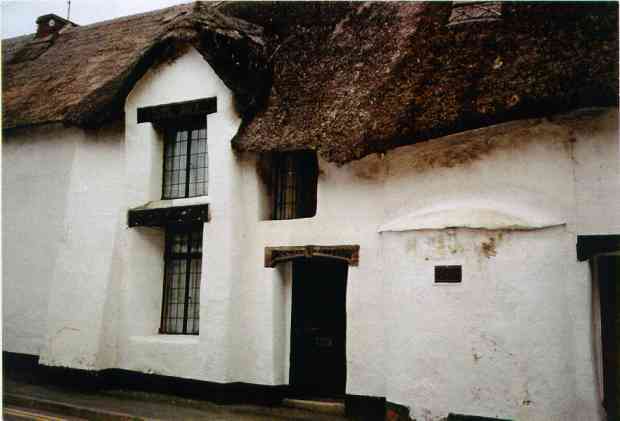 Old English cob houses have been around for centuries, so built in the right way, can last as long as any other building. See below a house in Devon that still stands today. So why would anybody want to live in a mud house? Why would we want to forsake our modern day comforts in order to go back to the stoneage era, many people think. Well, first of all, going green doesn’t mean a reduction in your standard of living. It just means living smarter. You can have the same amenities, but the basic ideas behind the way you build are different. 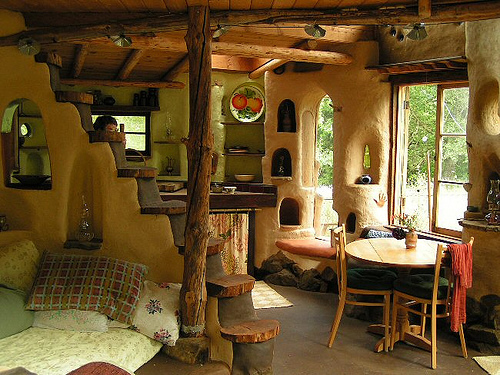 Cob houses built with today’s know-how, are not any less comfortable than the modern day buildings we enjoy today, but at a fraction of the price. 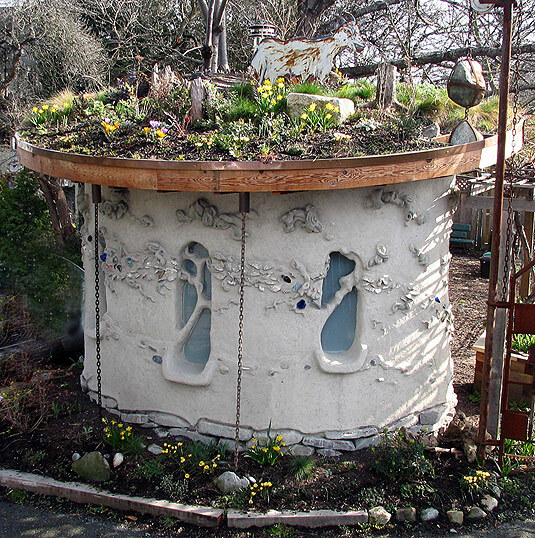 Cob building is enjoying a bit of a revival, particularly in U.K. and the northern Americas. 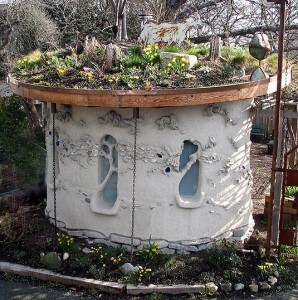 Workshops are held regularly and we see an impressive array of modern, beautiful cob houses. Clay, sand and straw at mixed at approx 20%, 70% and 10% respectively. Add water until you get a clayey material, which is not too runny. This is built directly on a good foundation of either rock or concrete. The technique of mixing the cob is done with the feet, stomping the mixture together on a tarp, then cob balls are made which are put unto the walls, ball by ball. Cob is also used for plastering. For best results add some cow and/or horse dung. The smell goes away when it dries and provides a very beautiful, plasticy finish. Dung is already thoroughly mixed, fine cob. The straw is already been divided into very small pieces, so you do not have to do this by hand. The straw allows for tensile strength, and provides a meshwork that keeps the building together and also prevents too much shrinkage. 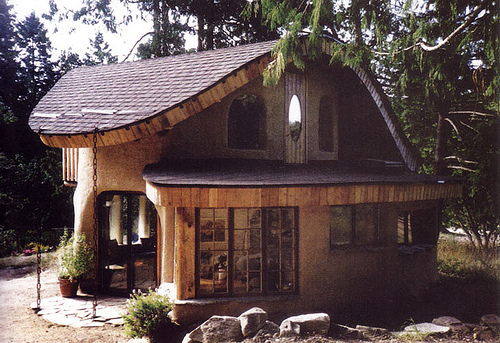 Oregon cob is a new and improved type of cob building perfected by welsh architect Ianto Evans and researcher Linda Smiley. There is no doubt that our economy (or lack thereof) is very closely linked to our shelter. We build expensive, expertly executed buildings and we end up spending 30-40 years of our lives in debt enslavement in order to repay the costs. And of course, we end up paying back 3 times the value of the house to the banks when we are done. This is because the material is chemically produced and expensive. Cement, lumber, glass, commercially quarried stone are all expensive building materials. Also, since they are so specialised, only a few people have the necessary skills to build with them. The constituents of cob are found everywhere. Before we became so damned civilised, we always built our own shelters, through community effort, and the most used material was, well, dirt! Because dirt is plentiful the costs are automatically reduced to a fraction of the costs of a conventional house. Built correctly with a few tricks up one’s sleeve they are just as durable as any concrete house, and much more beautiful. So you get a personally styled, beautiful mud dwelling, at a fraction of the price. Cob is also easy to use when we have windows and doors that are not uniform, i.e recycled windows and doors. Because we are not using standardised measures, like 2 by 4 planks and the like, it is much easier to incorporate little bits and bobs of recycled material that we may find lying around. The more recycled materials we can use in our building, the cheaper the overall costs will be. Also, furniture, like shelves, benches along the wall, sofas, kitchen counters, even beds can be made from the same cob, thereby reducing costs when it comes to furnishing. Because you are involved in a very hands-on process, the end result is very unique and carries the signature of the owner. 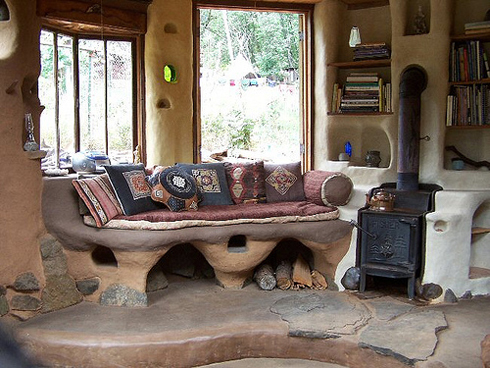 Cob-building is literally a sculpting method, where you create the house from the ground, shaping it as you go. You can easily incorporate bottle walls, driftwood you find around, or other material you might find esthetically appealing. It is basically playing with mud, as we did when we were children (quite instinctively, I would say) but on a much larger scale. The houses are not by any means any less than conventional houses when it comes to overall layout, but they are much more interesting and esthetically pleasing to behold. A small bungalow, perfect as a guest house. Because all the materials are biologically degradable, it is a much healthier way to build, not only for the planet, but for us. How many countless of diseases have we experienced in our ignorance of technological wonder-materials, like Asbestos, cement, glass fiber and the like. With these more ‘conventional’ building materials, we are well advised to use protection when we work with them as the diseases and symptoms they can cause are not to be trifled with. However, we see that ignorance or recklessness in how these materials are handled is quite common in the general population. Cob is natural and so it isn’t at all bad for you, in fact, it can be healthy! How many of us haven’t been to spas where hot mud baths are eagerly marketed for doing wonders for our skin. 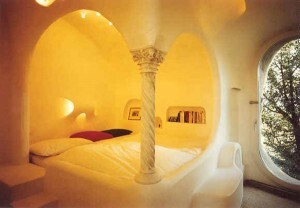 Cob is a great insulator. Because it is made of dirt and straw, it keeps naturally cool in the summer and warm in the winter. With a bit of intelligent design in the construction process where you pay attention to the lay of the land and utilise the sun in the form of windows facing south, you can keep a very pleasant temperature in your house all year. Also, since cob is fireproof, ovens have been built from cob than can easily be attached to your cob sofa, so you have a heated sofa to lounge on in the cold months. 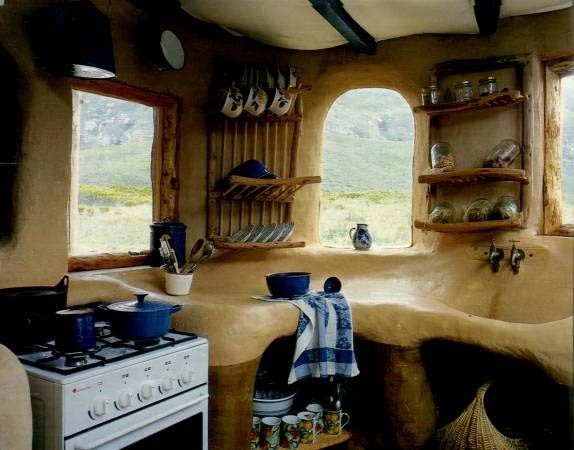 So cob is cheap, plentiful and available everywhere, easy to build with, bio-degradable, creates beautiful results, is fireproof, termiteproof, earth quake resistant and fun! Labour intensive, so it could be time consuming if you are few or one person on the project. Difficult to build in wet weather, as the walls take longer to dry. Plot of land is needed. It is absolutely an interesting way of building, The end-result is always beautiful and unique. The more you work on it yourself, the cheaper it will be. There is almost no end to the creative solutions that can be found with this type of building. It is easy to build with cob, however, it is labour intensive. It takes time. However, the fact that it takes time can also be a blessing for novice builders, as mistakes can easily be rectified. It is in thread with a more sustainable way of life. Throw in a VAWT (vertical axis wind turbine), a solar panel, greywater system and a natural pond, and you are really on the way! The world needs people who dare to think and do differently. There are choices, you just have to become aware of them! Don’t be afraid to try something new. Good things come to those who travel on the path less traveled.